"I make this recipe for my husband for lunch. 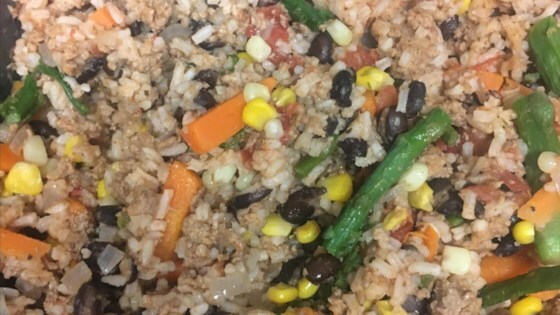 He loves the Cajun Style Sausage and Rice, however it plays havoc on his stomach at times but I found this recipe doesn't do that and he enjoys it almost as much. If you like cheese it also tastes very good with some sprinkled on the top after you remove it from the oven. " Heat a large skillet over medium-high heat and stir in the ground beef. Cook and stir until the beef is crumbly, evenly browned, and no longer pink. Drain and discard any excess grease. Add chopped onion to beef and cook and stir for 3 to 5 minutes. Stir in the cooked rice, beans, tomatoes, and Cajun seasoning. Pour into a casserole dish. Cover and bake in the preheated oven for 25 minutes until hot, stirring once. Very easy recipe and even the kids loved it. Used the Creole Seasoning recipe from this site. Next time I would sprinkle half the spice on the onion and beef while. browning. Sprinkle of cheese on top is great. very good i will make this again. i did not use a full 2 t of cajun seasoning i used 1.5 approx and its perfect.